Thanks to Andrew VanDerLinden from Organized Kidmin for sharing this article. Have you ever heard the term “Unforced Error?” It’s often used in sports like tennis or basketball. An unforced error is a mistake made, a shot missed, or a point lost that is entirely the result of the player’s own blunder. Usually referring to an easy shot in a non pressure situation. Usually we call them mistakes. 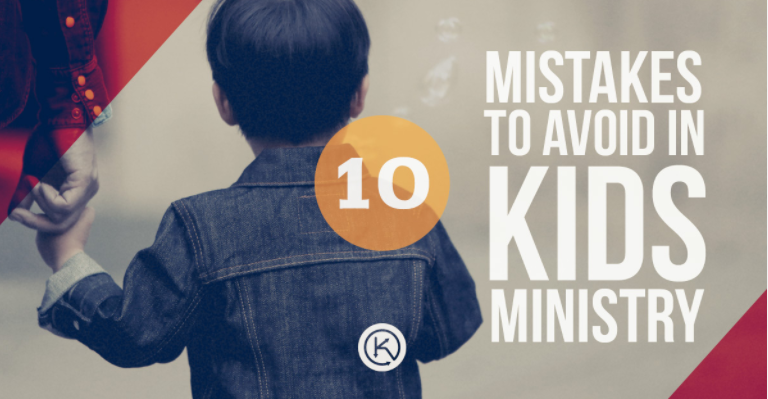 In this post I want to share 10 of the most common mistakes “Unforced Errors” made in ministry to kids. I’ve made every one of these mistakes. Sadly, many more than once. I hope you can learn from this list and avoid the mistakes I’ve made. More likely, you’ve already made these mistakes and need to take action to stop making them moving forward. 1. Spending all your time, energy, resources on kids. I love kids, that’s why I serve in kids ministry. I love kids, I put up with adults. It’s important to remember, you work with one set of kids and three sets of adults. There are the parents, volunteers, and staff at our church. If you want a healthy ministry you, must be able to interact and lead both kids and adults. 5. Lacking balance in the ministries you lead. An average children’s department is made up of between five and ten different ministries. Nursery, preschool, elementary, midweek, seasonal, boy clubs, girl clubs, VBS, outreaches, and the list goes on. You must overcome the temptation to spend all your time, energy and money on the area you directly lead while starving the other areas of your department. Don’t play favorites when it comes to the ministries you lead. Ask yourself, where do I spend my ministry funds, where do I add the most volunteers, which volunteers do I appreciate the most? The answers will be revealing. 6. Talking about needs rather than vision. If you need more volunteers, more resources, more space, talking about the need motivates no-one. It’s better to share your vision, passion, and goals for your ministry. When people hear what God is doing in your ministry, rather than what is lacking, they will want to be involved and they will want to give toward it. 8. Trying to be the primary disciple maker of kids. This is a trap we all fall into from time to time. Parents are the primary disciple makers of their children. Spiritual formation must be done by parents, not for parents. Your role is to empower, equip and encourage parents in discipling their children. 9. Failing to find balance between family and ministry. This is still a battle that I fight every day. I love what I do, if I didn’t I would do something else. You need to learn to guard against giving all your time, energy, and attention to the ministry and giving your family the leftovers. Here’s what I try to do: Guard my family time and take regular scheduled time off every week. Its called a day off, when’s the last time you had one? I use the same skills that make me successful in ministry to plan family time. I set priorities at home, manage my home life with the same intentionality and effort I would a big event or ministry at the church. I identify people and things that throw me off balance and take action to address them. 10. Working toward your own vision. The role of the Children’s Pastor and Children’s Director is to serve another person’s vision. I exist to serve my Lead Pastor and help him shepherd the congregation. You must represent the leader in everything you do. You must take the vision of your ministry the same direction as the rest of the church. The direction set by the Pastor. You shouldn’t have a separate vision for your department, it should match the vision of your leader. There are other mistakes that didn’t make the top 10. It would be impossible to create an exhaustive list. But if you can learn to overcome these mistakes your ministry and families will be better for it. If you can see this list for what it is; “unforced errors”, and avoid them going forward, it will have an extremely positive impact on your ministry. Pick one of the mistakes from above and decide how you can take steps this week to avoid making that same mistake moving forward.